As it's getting colder earlier in Minneapolis this year, some homeowners are getting ready for the winter by replacing their old boiler with a brand new boiler. Boilers that are over 20 years old require extra time and money to keep them running sufficiently. New boilers provide homeowners with a piece of mind knowing they will not have to worry about the boiler during the coldest times of the year. Not only are new boilers more dependable, but they also require less energy to run, resulting in a lower monthly energy bill. Many new installations will also qualify for rebates. Mill City Heating & Cooling is here to help you choose the right boiler and financing options. 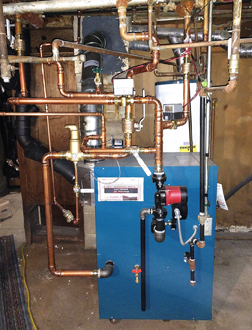 A recent customer in Minneapolis purchased a home with two boilers that were over 25 years old and in all-around bad shape. Boiler pipes were also corroded and leaking, some valves had failed and the flue going into the chimney was loose. She did not want to worry about encountering any heating problems over the winter season, so she chose Mill City Heating & Cooling to replace the two boilers with one new boiler and have the boiler piping, valves, and flue replaced at the same time. She is now comforted knowing that she does not have to worry about her heating system for many years to come. She is also delighted that she will be saving money with the lower energy cost associated with running one high-efficiency boiler instead of two older ones. Her 84% efficient boiler also qualified her for a $300 rebate from CenterPoint Energy.